With all the summer holidays done and it’s finally starting to feel like autumn, my salad box lunches are out of the window! 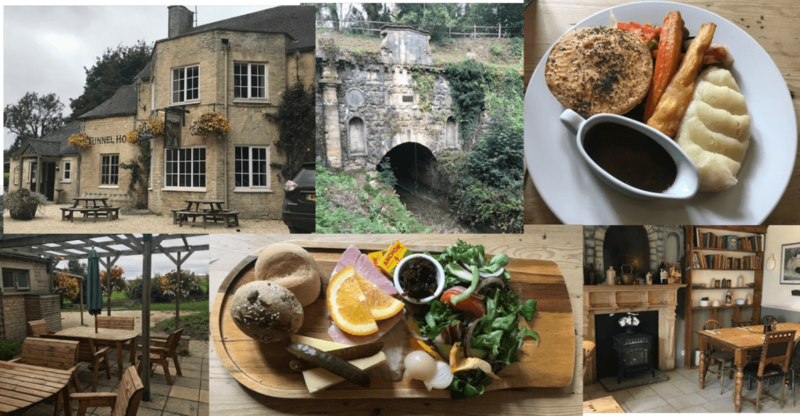 When Ian suggested a working lunch and that we head out further afield who was I to say no, especially at the promise of a glorious country Cotswold pub which boasts high quality fresh food prepared on site, using local suppliers and a five star hygiene rating. My only slight concern was when he asked how low the suspension on my car was, that’s the problem with these middle-aged men and their low slung sports cars, can’t take them anywhere! I realised what he was talking about as we passed the small village of Coates near Cirencester and he said drive straight on towards the hedge, don’t follow the road. We ended up travelling on a very bumpy narrow lane, mostly in first gear, you’d think I had Kangaroo petrol. After a few minutes the lane opened out into the car park of Tunnel House Inn, what a find. This beautiful pub built in 1770s is set alongside the Thames & Severn Canal and I can imagine is a great pit stop for those out on a walk, which is actually how Ian discovered it being some 5 miles from his home. Inside the traditional décor is welcoming and for a Tuesday at 12.00pm this pub seemed already fairly busy, and a few sleepy dogs led around the stone flag floor, must be something to do with the pub having its own Doggy menu. While I was feeling cold and ready to appreciate some autumnal food, Ian was clinging to the last days of summer hence he ordered a ham and cheese ploughman’s and I went for the ‘pie of the day’ filled with chicken, leek, ham and mushroom, served with mash potato, roasted vegetables and red cabbage. When the food arrived, it looked delicious and I couldn’t wait to tuck in, but with such a generous helping I failed to finish my plate whilst Ian polished off the lot (and that was a huge chunk of cheese!). Too full to glance at a dessert menu or round off the meal with a coffee we sluggishly headed back to the office.